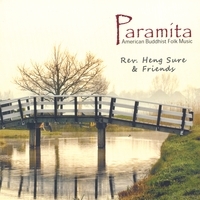 American Buddhist folk songs - - pioneering a new wave of Western Buddhist culture. Socially awake, talking about mad American Beef Cows, peak oil, and cause and effect, Rev. Heng Sure has been called "the Buddhist John Denver." These are clean, homespun tunes featuring guitar, banjo, mandolin, fiddle and dulcimer. The musicians helping out include some of the Bay Area's most experienced acoustic players: Henry Kaiser, Alan Senauke, Paul Hostetter, Josh Michaell, Robin Petrie, and Brian Godchaux.